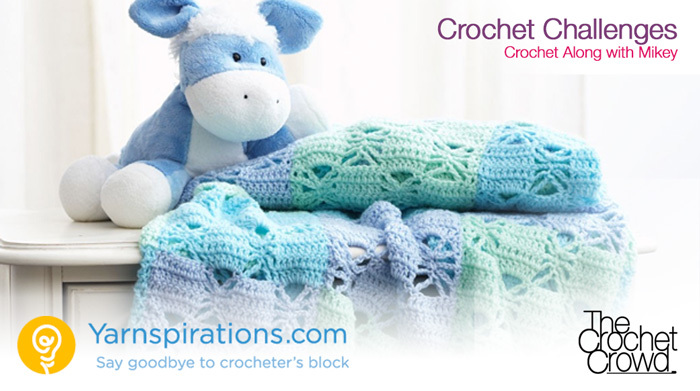 The fun begins July 1, 2014 when The Crochet Crowd goes on Stitch-cation together. Designed to enhance your crochet skills and pull ideas from your imagination, the Summer Stitch-cation is going to be really exciting to see everyone’s creativity unfold. At the end of the summer on Labour Day, Sept 1, 2014, everyone’s afghans must be submitted to qualify to win 1 of 3 Red Heart Fully Loaded Yarn Bags with Crochet Crowd Gifts. The 3 winners will be randomly drawn so everyone has an equal opportunity to win. 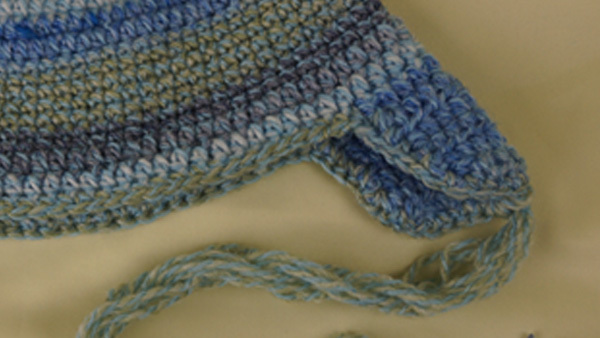 Learn and/or be refreshed with 10 different stitch combinations. Learn how to change colours effectively without hideous knots hanging out. Explore colour with a minimum of 8 colours must be used. Don’t be limited by making each square a different solid colour. Play with colour mixing within a square. During the submission process, we will be counting colours used to ensure fairness to all challengers. Exercise free will when deciding how to put your afghan together. Free Choice Border, a border must be applied, you have to figure the border out on your own and apply one. We are using a Size H, 5.0 mm Crochet Hook. You can substitute your hook for larger results. We are using 9 colours. We have chosen 9 skeins of the Red Heart Super Saver 7 oz, the size you will find in Walmart. 8 Colours are in the body of the afghan with an additional 9th colour in the border that attaches the squares together. I have created a Stitch-cation Workbook that is free and downloadable. I found with myself while working on this project that I am confused by the names of the squares. I kept having to go back and trying to figure out which squares I have done and which squares are still left. 8 Colours Minimum must be used. We need to ensure we can count 8 colours when you submit your photo. You can use more than 8 if you wish. For this challenge, 8 different colours are required for a minimum. We are going to be counting the colours when you submit with no exceptions of afghans that are not having enough colours. If using variegated yarns, 1 type of variegated yarn ball is classified as 1 colour of the 8 regardless of how many colours are in the one ball. The goal is to explore colour with this afghan by using creativity to put your colours together. Your afghan minimum size is 20 squares. It will be 4 squares wide by 5 squares long. Your afghan MUST have at least 2 of each square design to qualify. You can make your afghans much bigger but you still must meet the minimum of having at least 2 of each style of square in your afghan. The point of this afghan is to learn stitches and concepts. It is your free choice on how to you attach your squares together. You can crochet and/or sew them together. Part of the challenge is figuring out what you prefer. A border around the entire afghan must be applied that is your free choice to create. The border must be a minimum of 4 rounds to qualify. There is no sign up required to participate. Complete the project and submit your photo when you are done. 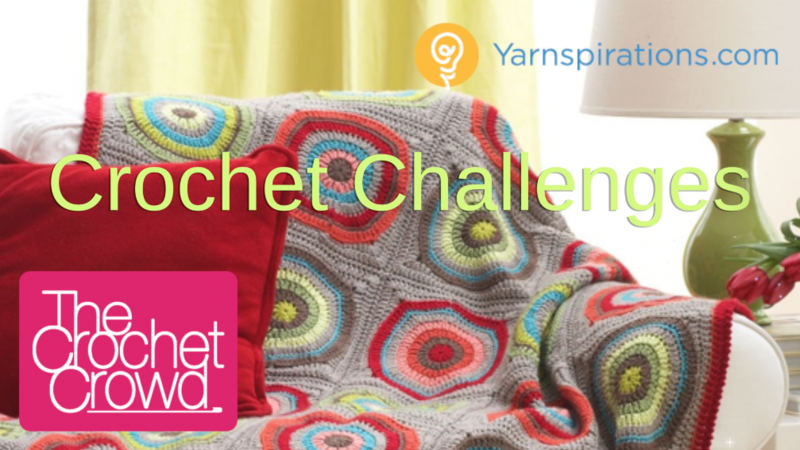 This challenge is open to all Crochet Crowd Community Members. There are no restrictions of country origin associated to our challenges. If you are a member of The Crochet Crowd, you may participate. You may use any yarn you wish. You may substitute your yarn for any brand or colors that you desire. You may create any color scheme. For this challenge, 8 different colours are required. We are going to be counting the colours when you submit with no exceptions of afghans that are not having enough colours. If using variegated yarns, 1 type of variegated yarn ball is classified as 1 colour of the 8 regardless of how many colours are in the one ball. The goal is to explore colour with this afghan by using creativity to put your colours together. We require your photo to show the entire project so we know the entire project is done. The project must be showing all of the project for us to examine it’s completion. Ensure your project is completely finished with yarn tails and etc not showing. It’s like giving it out as a gift, we want to the see the photo showing as if you were gifting us the finished product. This way we know you are completely done. I just came across this pattern browsing your site and thought it would be wonderful to teach my crochet group how to do these and make their own blankets too. That being said I seen in your stitch-cation e-book that you put that we are to use a 5 mm or I hook. Do you mean either or is this a mistake and you meant a 5.5mm for the I hook? I get the no prize thing, but what about offering ribbons in place of prizes, like they did in past decades at the fairs and shows and such. Just a thought, I think a ribbon with a pic of the winning afghan framed would be a great prize. Gives you bragging rights if you have a competitive family like mine. Have you any other stitch cation/sampler afghan patterns? I’ve 32 different blankets to crochet and all my crochet stuff has been stolen whilst I’ve been in hospital here. Theres no wifi in here so I’ve limited access to the internet. I desperately need help finding patterns/video tutorials for afghans. My email address is gemma_madden@yahoo.com. I’m not sure of what sites offer free patterns as I’d all this info with the stuff that was stolen and the patterns too. How do I sign up for curtzy crochet lessons? I tried your link earlier but it isn’t working and when I google it I can’t find it. When I first signed up for your newsletter it said then that I’d be sent weekly tutorials and that was last year but I never received any tutorials. I also recommended it to friends and they too complained of not receiving tutorials so I felt very embarrassed recommending you when they didn’t get what was advertised. The Curtzy Videos for the emails have not been working for a year. They are all still available on our YouTube Channel. http://youtube.com/mikeyssmail The email system doesn’t always work for everyone. It can be touchy. With the new legislation of anti-spamming laws, we are no longer manually adding anyone to altering emails within our database. If we manually add you, we have to contact you in 2 years to ask your permission. With 110,000 in our list right now, we don’t have the people power to make this happen as it’s just Cathy and I.
I am on my second stitchcation, but it is a Christmas one, only 3 colors, red, white and green, love this project. Been watching the Flickr page and noticed you haven’t uploaded any more pics for Stitchcation in a couple of days. (I know you are SUPER busy) Submitted mine yesterday and wondered if I should resubmit? Thank you! I did a wack yesterday afternoon… I had to launch September’s challenge and I was up until 1 am this morning getting ready for it.. I’m doing the best I can… I think I have 75 or more entries to go through this morning… Please be patient with me… I’m trying. Hi Mikey! Fell in love with u on UTube & am so glad to have found the Crochet Crowd and this Crochet Challenge! Most likely I won’t be entering this Challenge but, I WILL DEFINITELY BE TRYING THE NEW, TO ME, STITCHES!! In 1964, as a young bride, my sister-in-law, from the Philippine Islands, handed me a stainless steel hook with a tip the size of a pin head & #10 crochet thread! She taught me how to make a chain!!! I HAD MILES OF CHAINS! Being in the military. we transferred before she taught me any other stitches. Many years later, as an avid sewer of clothing for my children & myself, I came across a Simplicity GRANNY SQUARE pattern for a poncho & cap for my daughter, age 7. Well, that was the beginning of MY love affair with CROCHET! After countless projects and many hours of creating my own stitches and garments, Now, in 2014, I see all of these new stitches that you have offered in your CROCHET CHALLENGE that I have never seen before!!! Am I excited to try these new found stitches???? YOU BET I AM! Mikey, KEEP ON BEING CROCHET MANIC!!!! We learn so much from you and I do love your sense of humor and giggle! Hiya, would a red yarn and a red yarn with sparkles count as separate colours?